I’ve been learning more about Jesus by memorizing “The Living Christ.” It says, “Though sinless, He was baptized to fulfill all righteousness. He went about doing good.” I like the story of Jesus’s baptism. It’s my second favorite story of Jesus. My favorite one is about Him being born because I like Christmas. Jesus showed us that being baptized is choosing the right. In the Bible Dictionary, it says baptism is from a Greek word meaning to “dip” or “immerse.” Jesus got baptized in a river called the River Jordan. He was baptized by John the Baptist. I really liked Dorothy’s baptism, and all of the other baptisms I’ve gone to. I like baptisms because it gives me a happy feeling when I go to baptisms. I like choosing the right every day. After we get baptized, we get the gift of the Holy Ghost. I know that Jesus got baptized to show an example. I’m happy that I will get baptized in two years. In the name of Jesus Christ, Amen. 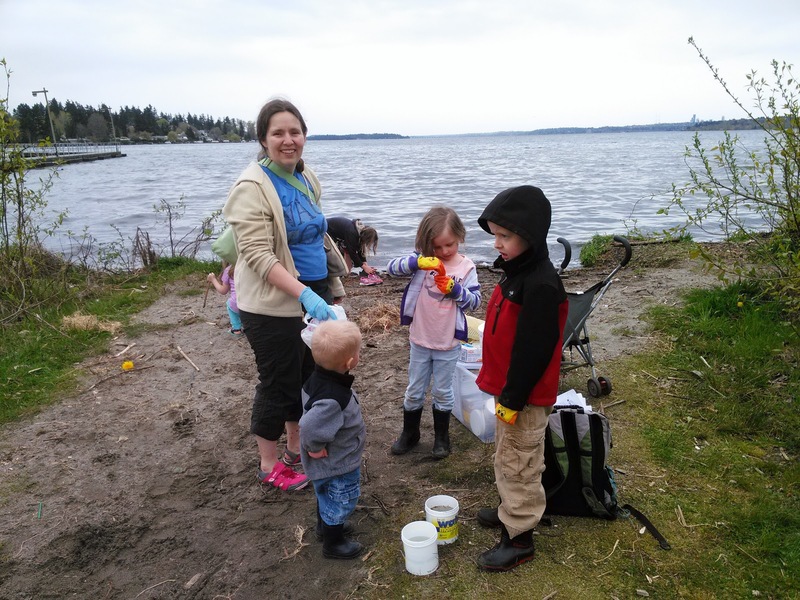 Annie, who teaches science to my kids on Monday mornings, checked out a water testing kit from a local wastewater treatment facility, and we took it to a couple of local beaches to test Lake Washington the day after Easter/Eloise's birthday. The weather had been warming up, so we were woefully under dressed for the bitter wind coming off the water. 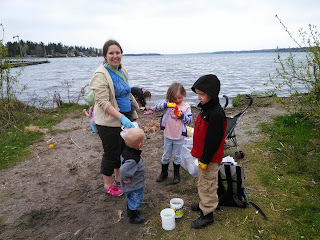 We did a bunch of testing at Juanita Beach, but the kids were too cold to get out of the car at O.O. Denny beach, so we just grabbed some samples and took them home to our house to test. This was so cool. We tested pH, Oxygen, turbidity, and looked at macro-invertebrates to determine pollution levels. Different species can survive varying levels of pollution, so we identified bugs and larvae to determine the cleanliness of the water. 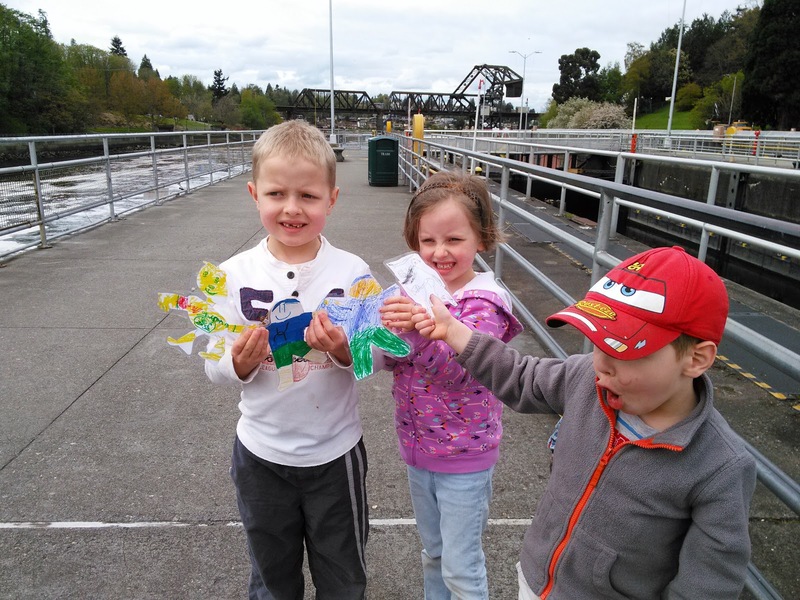 We remembered the Flat Stanley that Landon sent us, and had to cram in a last few activities with him before we returned him to Arizona by May 1. 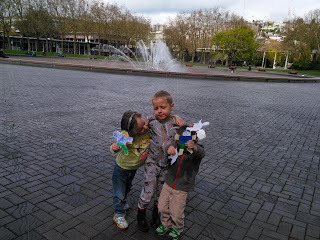 We took him to the Pacific Science Center. 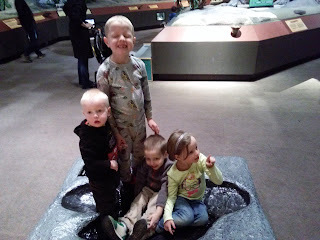 I took this picture because I know it won't be long before we won't be able to fit all four kids into one dinosaur footprint. I know they look squished, but there was actually plenty of room for them, if they didn't always insist on parking themselves in exactly the same spot. 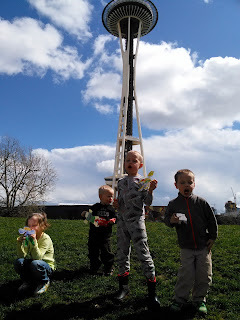 We went outside for lunch, leftover birthday cupcakes, and a clear shot of the space needle. We are big fans of Flat Stanley, as evidenced by Jared's blog. 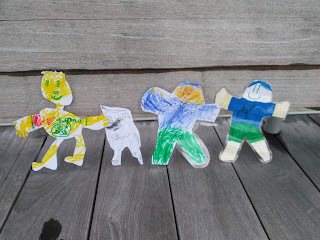 Each of the kids made a Stanley cutout as a "support group" of flat kids. A lot of the Stanleys had to be in all of the pictures. Here they are at International Fountain, dreaming of days warm enough to put on swimming suits and play in the water. Eloise's favorite place at the Pacific Science Center is the tidepool area. We often end our visits here. B was jealous of the attention Sammy's facial injury was getting him, so he crashed his bike and got a handlebar-end-shaped cut on his face, along with a bloody lip and a small cut on his eyelid. Okay, it was a total accident, but it's funny how they injure themselves back to back. 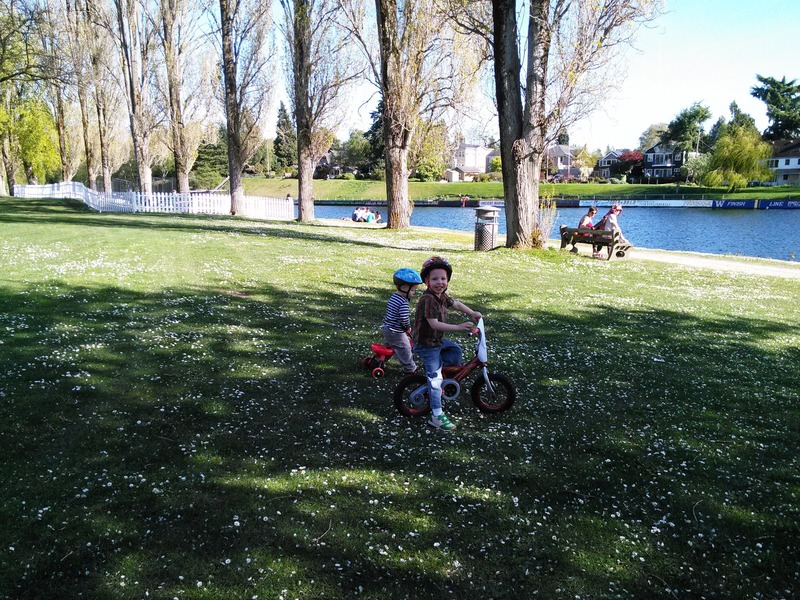 B was looking over his shoulder and failed to notice that he was about to bike into a stump. I'm starting to notice a pattern to these injuries. . . 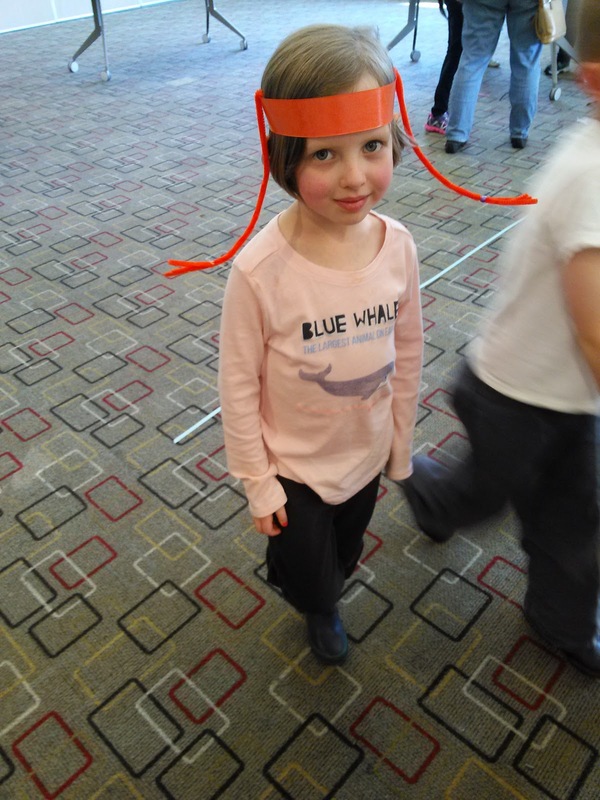 Since Eloise turned six, she was old enough to go to the Junior Classics book group at the Redmond library. 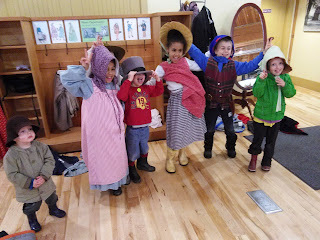 Can you guess what we read? Eloise was a big fan. This blue whale shirt was a birthday present. Eloise loves to tell us facts about animals. Her other loves are comics (Smurfs, Calvin and Hobbes, and Garfield), drawing and crafts of all kinds, gardening, and reading. We took Stanley to the Seattle temple of the Church of Jesus Christ of Latter Day Saints, where we met friends so that the moms could take turns going inside the temple. It was a lovely day. 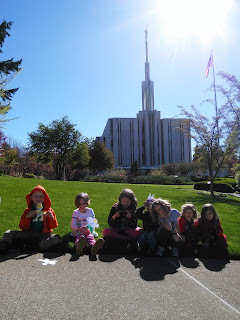 We brought a picnic, so we went to the park next to the temple (Robinswood Park) to eat and play. 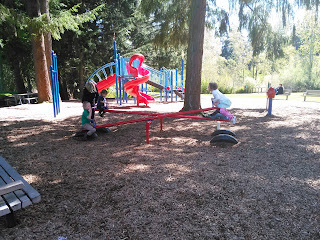 This is the only park we went to last summer that has real seesaws. 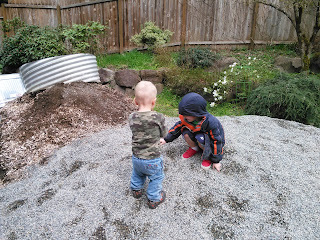 That afternoon we went home, worked frantically to get seeds in the ground for the garden, and left late to get to Seattle for a study/music class Jared and Eloise are participating in at the University of Washington. I took the freeway, like a fool on a Friday afternoon. We got stuck in traffic, B fell asleep, and we were half an hour late for the class. 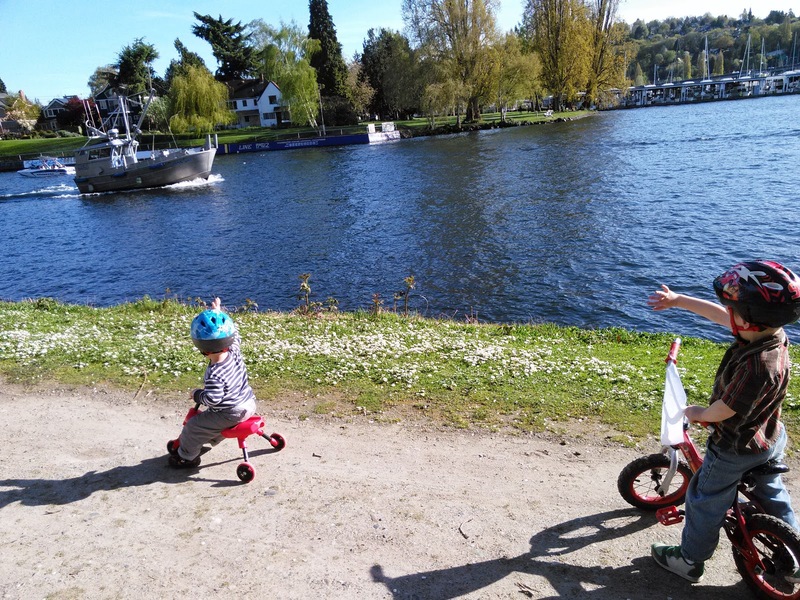 While the older kids were doing music, we took the little bikes down to the Lake Washington Ship Canal, which is at the back of the study building. There is a gravel path along the water here, and we saw the famous UW sculling teams out practicing. 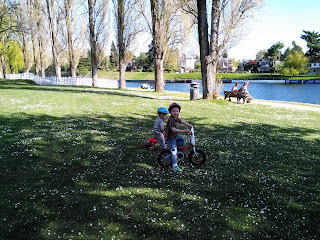 B and Sammy got a kick out of getting boat drivers and passengers to wave at them. Sammy's creativity is endlessly entertaining. I often hear him talking to his toys. I heard him putting a toy dinosaur to bed. "Go to bed, dinosaur. Do you want me to sing you a song? Okay. Just one song. Stay. In. Bed! Not get up, dinosaur!" In the picture below, he announced, "I have a BIG suitcase!" 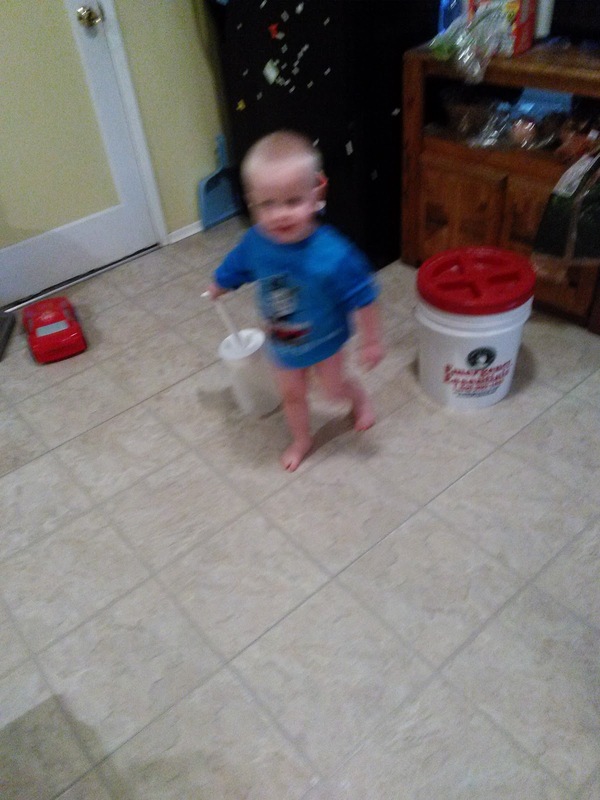 and proceeded to pull the pitcher/suitcase around the kitchen. 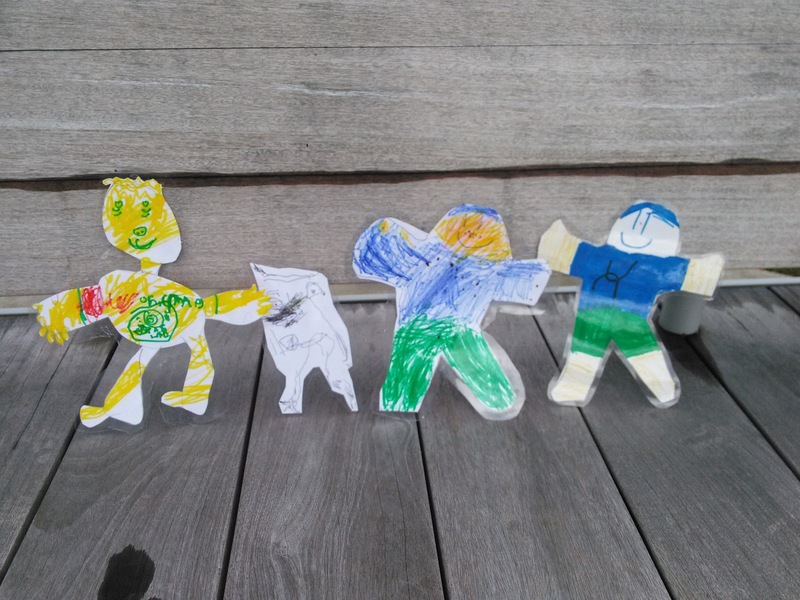 Here is a picture of the flat children's support group. They would like to warn children everywhere not to sleep with improperly hung bulletin boards above their beds. 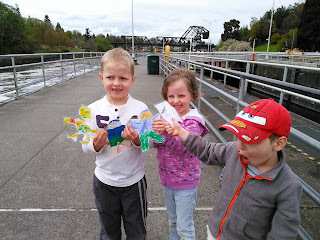 Our last stop with Stanley was the locks and fish ladder. 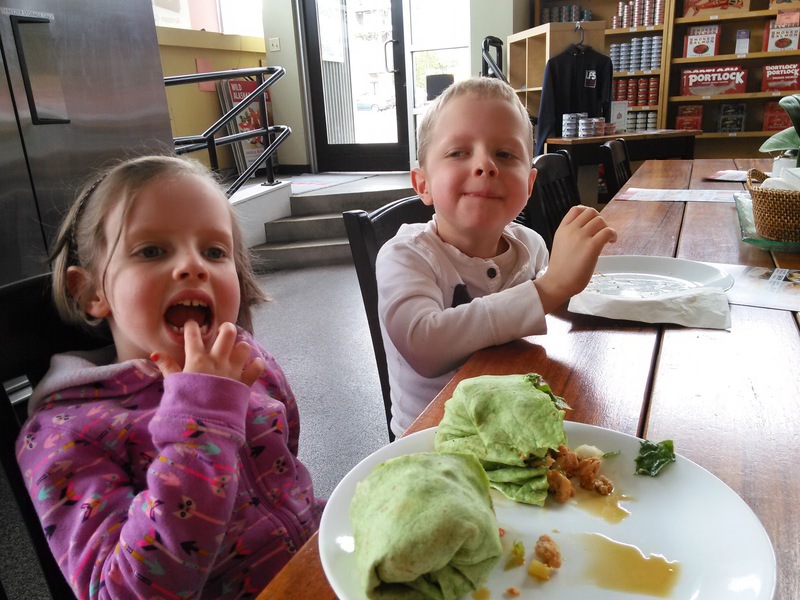 We got there in time to grab lunch from our favorite fish wrap spot. 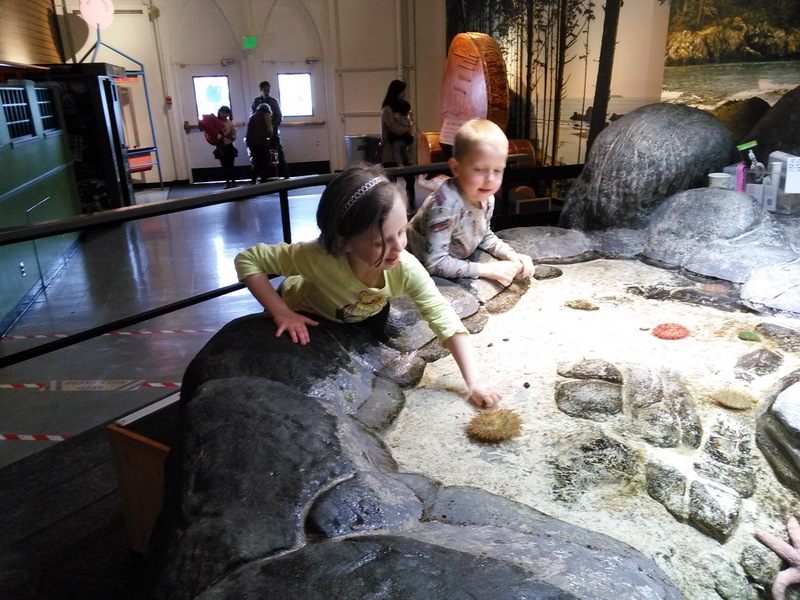 We saw a couple of tiny fish in the fish ladder. The locks were very quiet. I think we saw only one boat the whole time. All the extra rain this year meant that the water in the canal was high. All of the spillways on the dam were wide open. I don't think I've ever seen so much water coming through. Usually only one spillway is letting water through. Eloise's primary teacher (at church), Sister Mortenson, was expecting her first baby at the beginning of May, so Eloise made her a present. 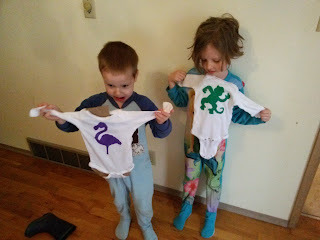 Since Eloise loves animals and crafts, she painted some onesies with animal stencils. She made a monkey, a flamingo, and a kangaroo. They turned out so well that we have plans to make more of these for future baby showers. 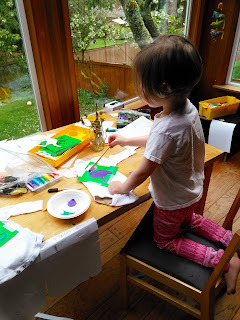 I helped Eloise tape the stencils to the shirts and put cardboard inside them, but she did the rest. Sammy got his hands on some fabric paint and ruined one of his own shirts, but that is to be expected from our number one mess maker. This wraps up April, and, we hope, most of the days of darkness and rain. 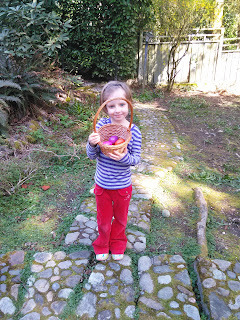 We were busy and over scheduled for the end of April. I am really trying to scale us back to one outing a day. Seattle is famous for its raininess, but this year has been an extra special rain year. In reality, Seattle doesn't get more rain than any other cities in the United States, but it averages 30 more days of cloud cover than the next cloudiest city. Between October 2016 and April 2017 we had something like nine days with less than 30% cloud cover. We spent the last six months in semi-darkness and perpetual drizzle. We broke records for the amount of actual rainfall in that time, too. 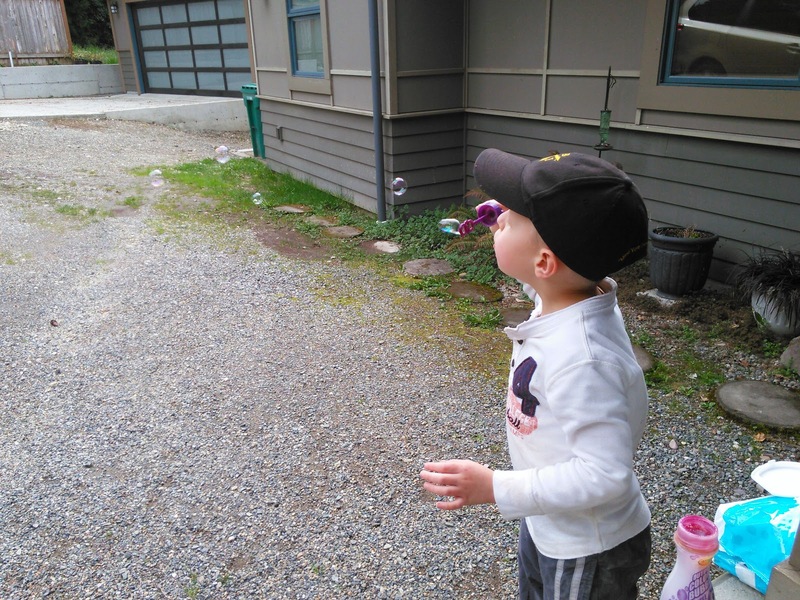 Fortunately, these kids know how to enjoy a damp day. I think we are actually going to have to retrain them for warm weather. 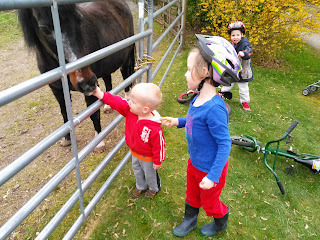 Sammy finally got brave enough to touch a horse. Of the two horses in our neighborhood, Sammy only likes the smaller one, Rainbow. Here he is with his friend. 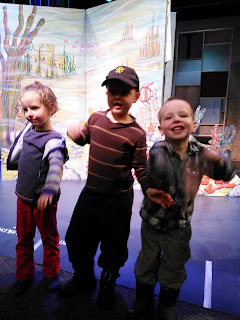 We went to a dress rehearsal of a children's production of "The Little Mermaid." In the end, the audience got to vote on whether to make the mermaid keep her promise and stay human all alone and without her voice, or give her another chance to be with her family. We have been talking about how important it is to keep promises, so B was really unsure about how to vote. It had a happy ending, though, so he was happy. Here they are swimming with the set behind them. It was a cool set that opened from one scene to another like a book. Sammy is such a goof. 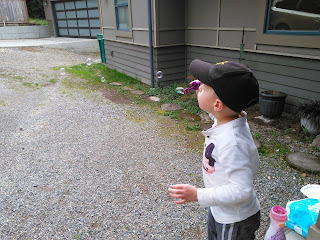 He thinks he is capable of doing all of the things that everyone else can do, and he keeps up very well. If he can't keep up, he changes the game for everyone. 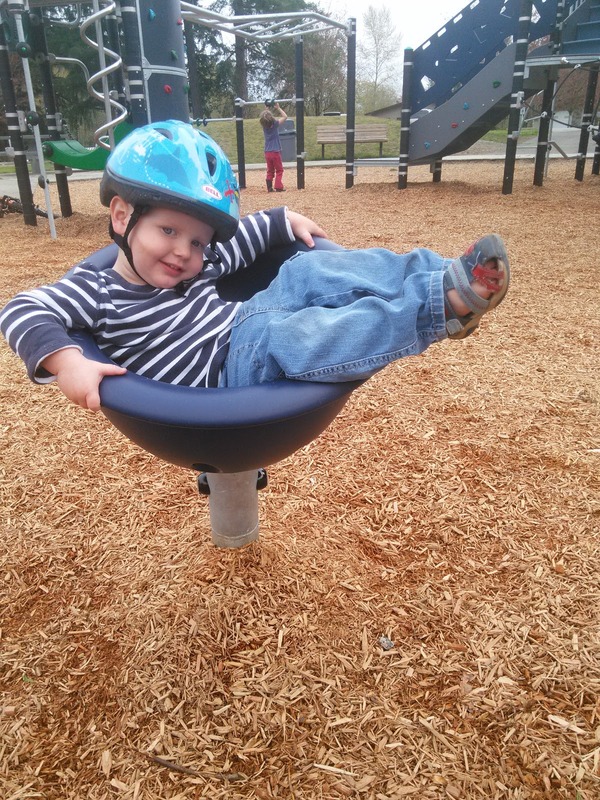 He almost always cries when it is time to leave the park. 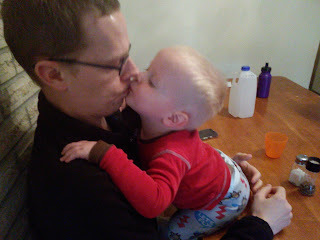 I'm just throwing this in there because, seriously, could this possibly be cuter? 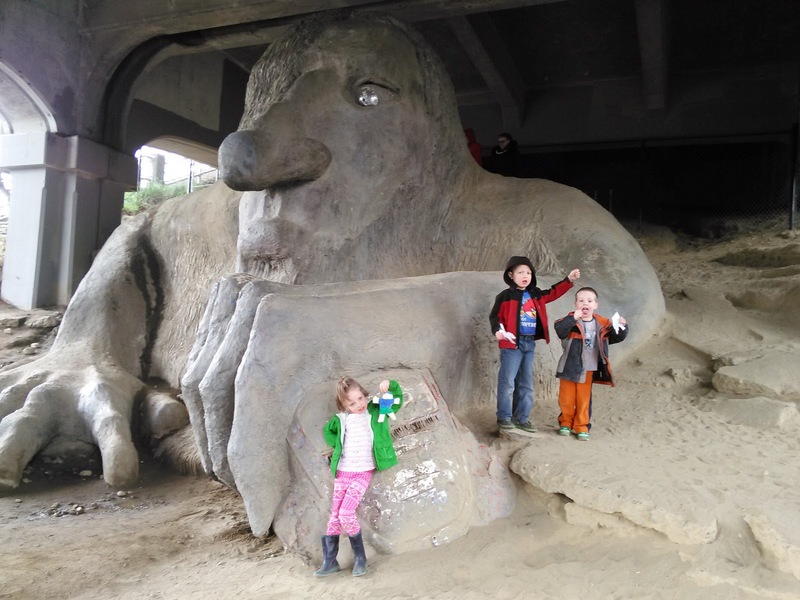 Our friend Landon sent us a Flat Stanley from Arizona, and we had to send it back by the end of April, so we crammed in some visits to cool places before we returned it. The Fremont Troll no longer scares any of my kids. 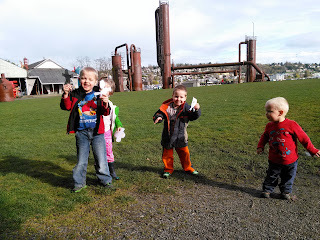 Gas Works Park in Seattle, with its gorgeous views and perpetual wind, was super soggy from all of the rain. It was hard to move without gushing water into our shoes. 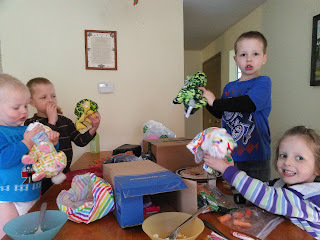 We got an Easter package from Grandma and Grandpa Knight. Thanks for all of the new stuffed friends, Grandma and Grandpa! 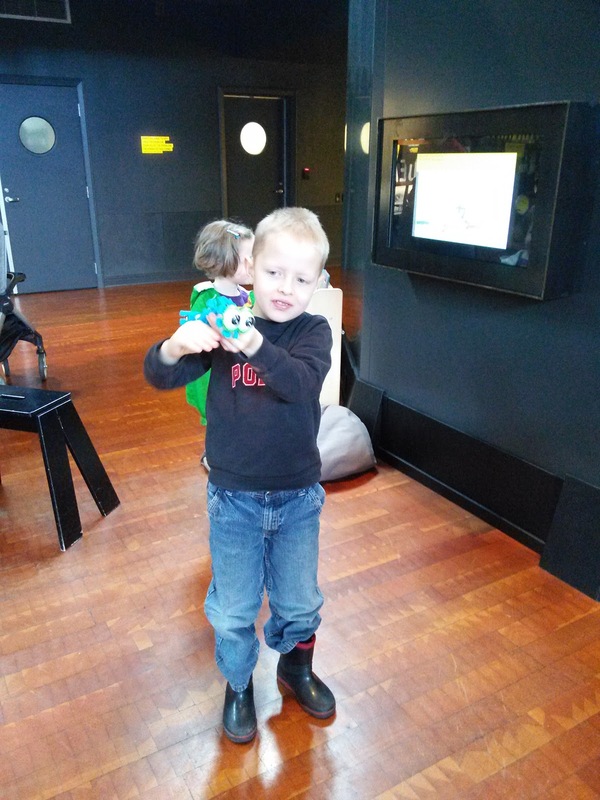 Our mother's helper/babysitter, Bailey, took a trip to Paris with her family. She brought back souvenirs for all of the kids, but Eloise got some special ones, since it was her birthday, and she loves Paris. 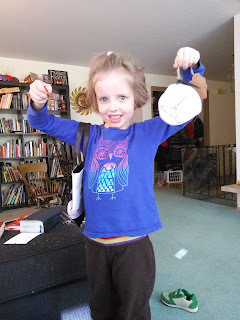 She got a Paris bag, with a coin purse with some real French Euros inside. 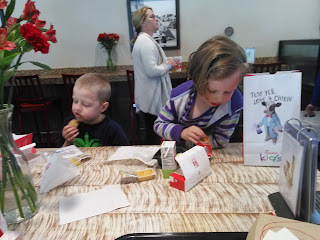 For her sixth birthday, Eloise asked to go out to eat for dinner. 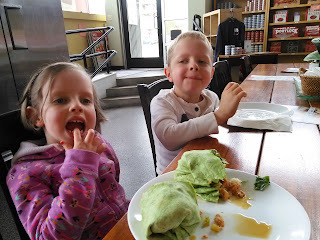 We ended up having her birthday party in the afternoon, so we went out for lunch instead. Chick-fil-A holds a strange appeal for my kids, even though they have never been to one with a play place. Sammy fell asleep on the way to lunch, so Todd stayed in the car with him, and the rest of us went inside to eat. 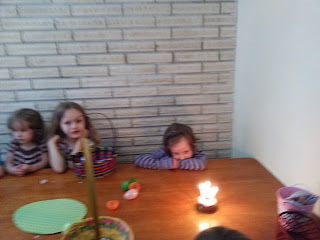 Eloise was absolutely delighted that her birthday fell on Easter this year. She insisted on having an Easter themed birthday party. 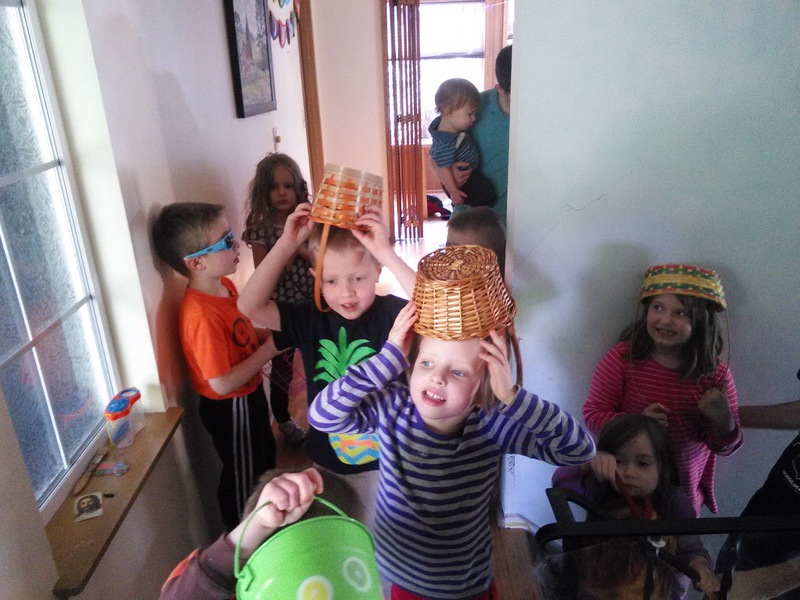 We dyed eggs, did a foam egg decorating craft, and had an egg hunt. Everyone got to keep their basket and eggs as a party favor. The back yard decorated itself. 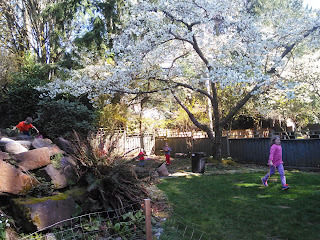 Our cherry trees were in full bloom. The Christensens and Carvers came over to celebrate with us. 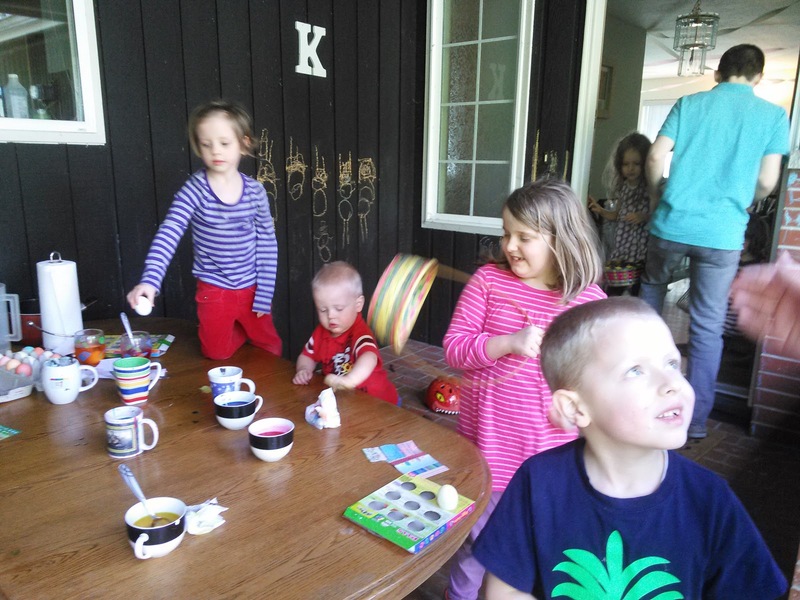 Just our three families now total 16 kids. I remember when having 12 or 15 people at a party seemed like a great feat. Now it is inevitable. It's a good thing we love chaos. Eloise had strawberry cupcakes because, she said, "Cupcakes taste better than cake." 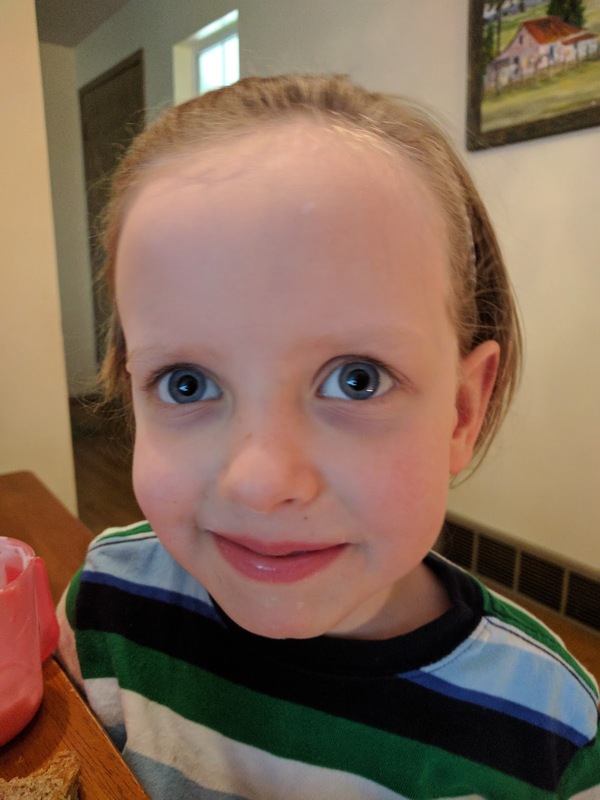 Happy birthday, six year old! The first week of April was spring break for our friends who go to public school. For us, this just meant doing the things we regularly do, but more field trips with friends in a shorter amount of time. 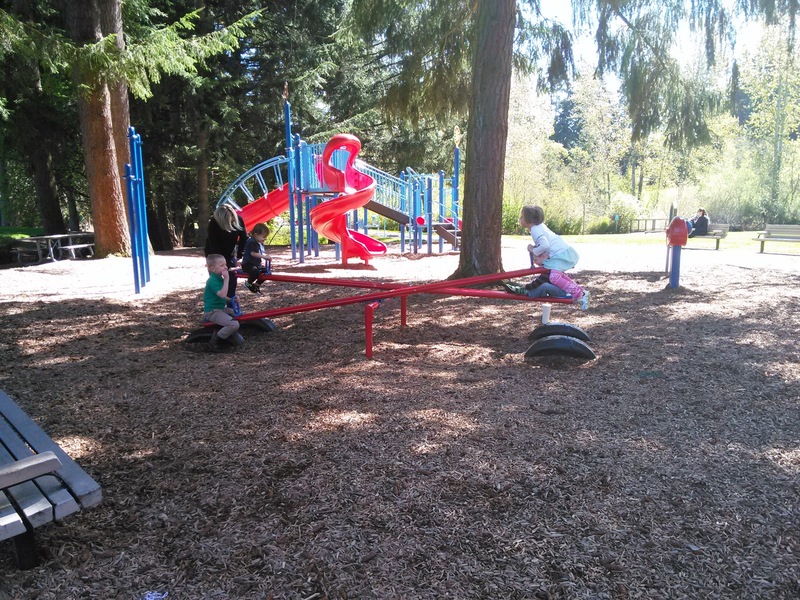 On Monday, B participated in a study at the University of Washington for four year olds. Yes, this is Eloise biting her nails as she watches him. She was so frustrated watching two four year old try to coordinate their movements (the study had something to do with social interactions between kids). She kept saying, "No! Do it together!" Jared and Eloise were very jealous that B got to do a study, but they felt better when I signed them up to do a ten week study/music class. 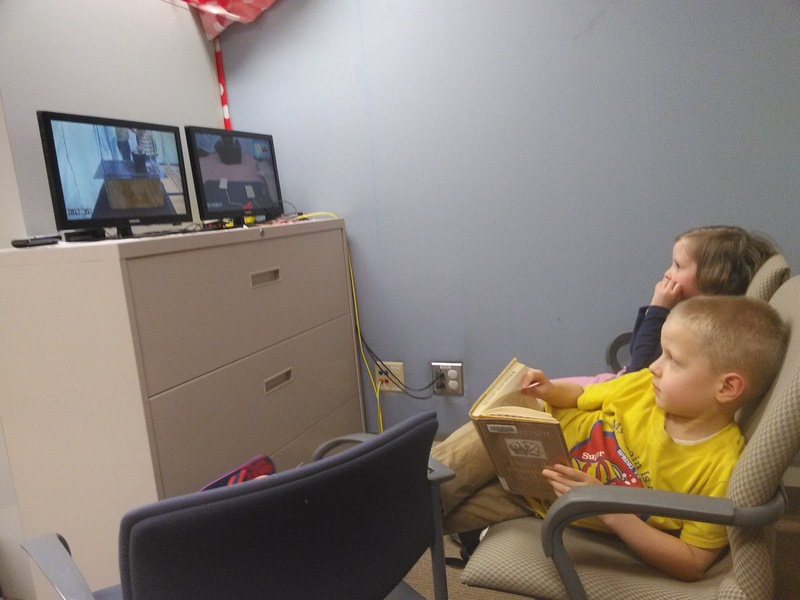 Now B is the jealous one, asking every week why Jared and Eloise get "to study" and he doesn't. 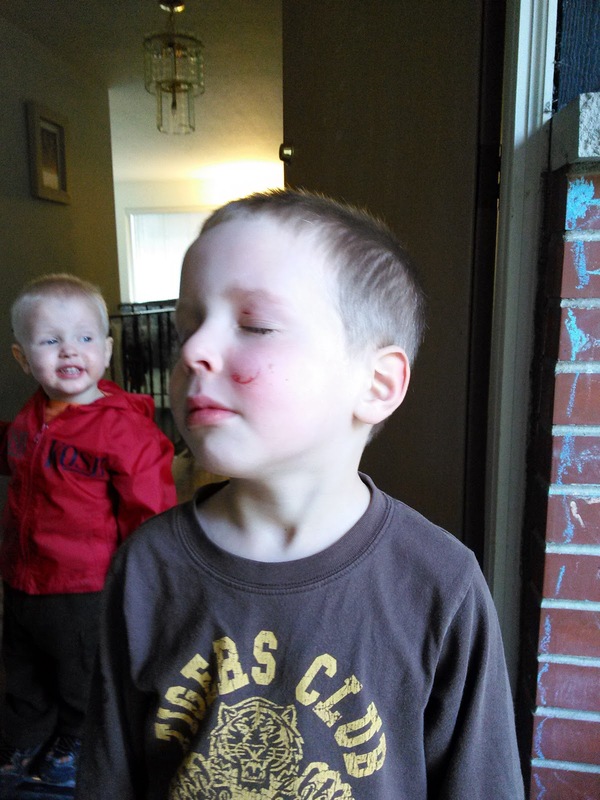 According to tradition, as soon as Sammy turned two he had to get a serious injury. His came from his bad habit of running while looking over his shoulder to see if anyone is coming with him/chasing him/following his lead. He was running across the room in his footie jammies, realized at the last second that he was about to run full tilt into the hearth, and attempted to change directions. The result of this direction change was his slippery feet sliding out from under him, and his full momentum colliding his face with the edge of the hearth. 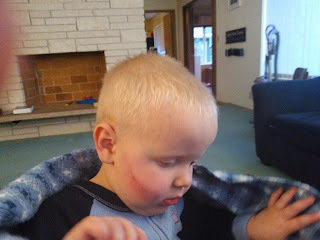 The bruise was bad enough that the next morning he bounded out of bed and came running down the hall, but stopped after a few steps, grabbed his cheek, and said, "Owwwww!" Over a month later the bruise is still visible. We started to get some semi-nice weather for part of a day here and there. I'm always a fan of having less lunch clean up. 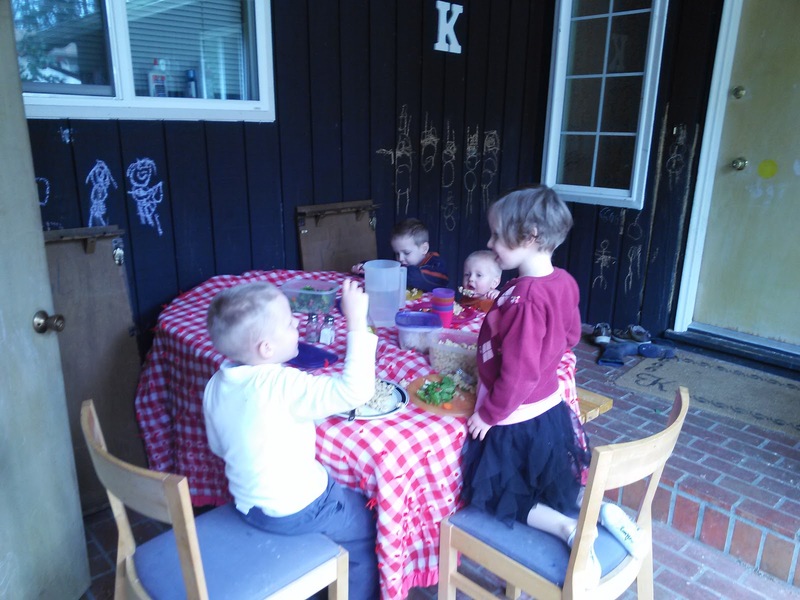 Picnic season is coming soon! One of the favorite events of our week is our Tuesday afternoon piano lesson time. 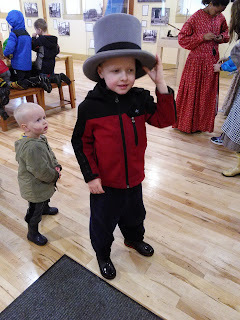 Our piano teacher, Sam's, mom has been B's primary teacher this year, so B looks forward to following her around while the other kids have piano lessons. Even if we just drop Jared and Eloise off to go run errands, we usually manage to find a few minutes to play in the Nielsons' magical yard. 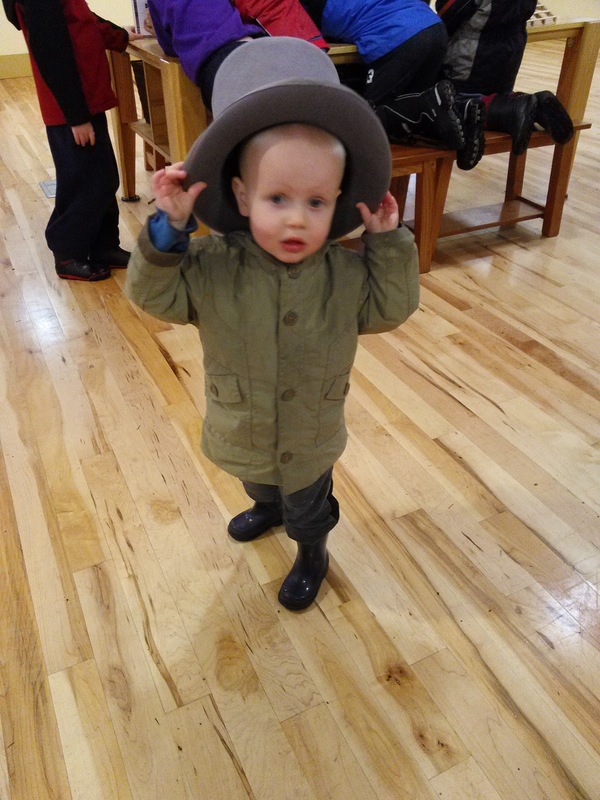 We had talked with the Christensens about going to Fort Casey, but we ended up voting against risking our toddlers lives with lots of unfenced precipes. 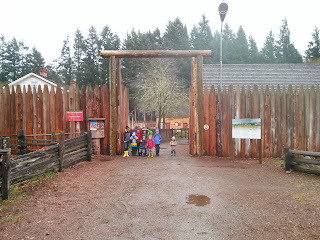 We ended up going to Fort Nisqually, an old trading post replica, instead. Rebecca brought along a couple of extra girls from her neighborhood. 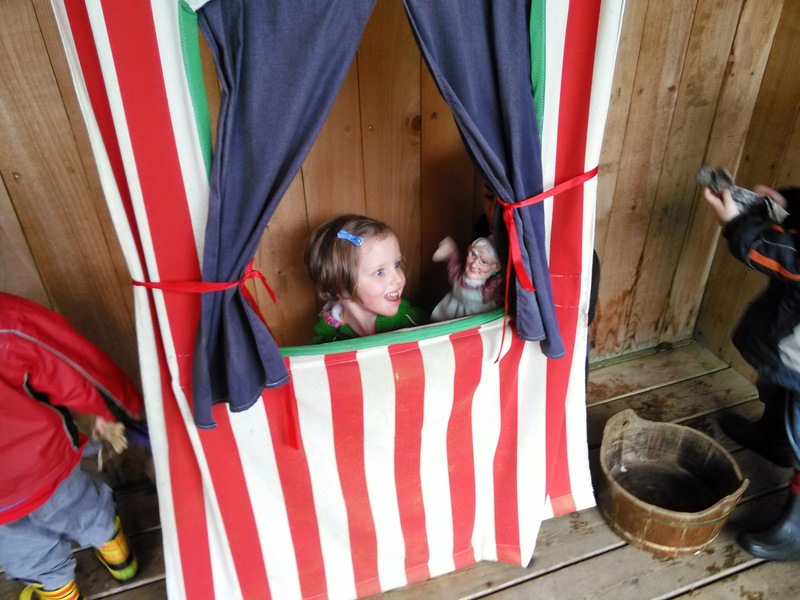 It was raining cats and dogs, but we still managed to find a covered space for a picnic. It was fun to learn some things about the conditions early pioneers faced in the Seattle area. I think the pouring rain that soaked us gave us a pretty clear picture of what life would have been like for people without heaters, dryers, electric stoves, or even fans. Brrrrrr! 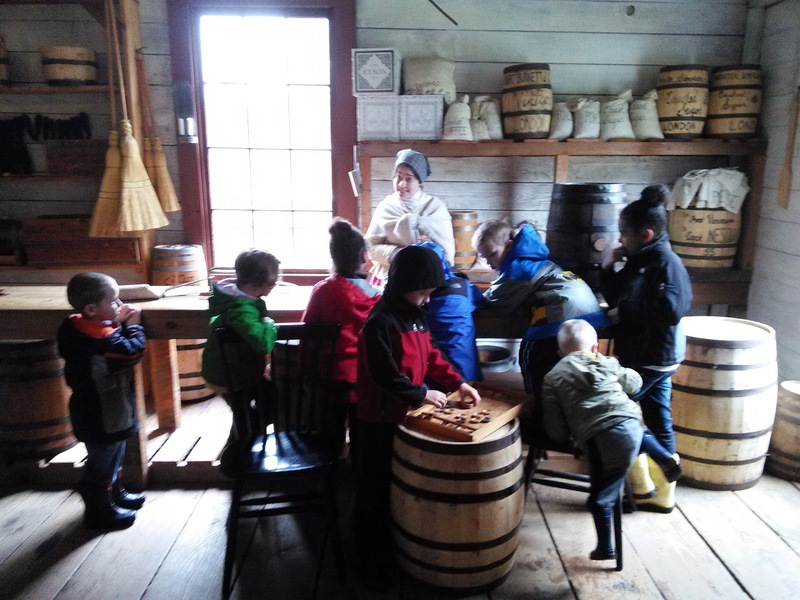 All of the kids loved playing with some toys from the pioneer period. I love these pictures because it is so typical, the way Sammy is looking at Jared. . .
. . . and how Sammy tries to do everything Jared does. Sammy ended up getting so wet running through puddles at Fort Nisqually that merely saying that he swamped his boots doesn't quite describe the torrent of water that gushed out of his boots when I took them off of him as he got into the car. 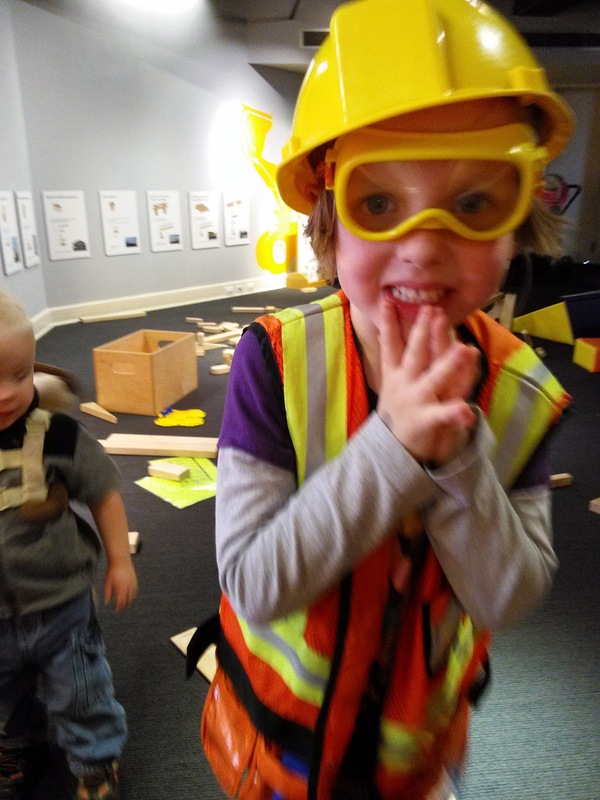 The next day was free museum day in Seattle, so we met the Christensens at the Museum of History and Industry. 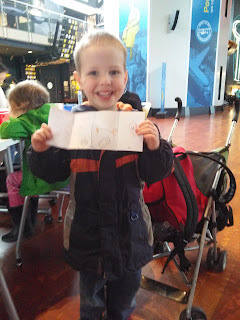 They were late, so we went ahead and did the craft of the day while we waited. B made a pop up book about a car. Eloise made one about a giraffe. 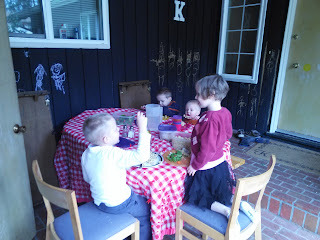 Our friends arrived in time for lunch, and then we set to inventing. 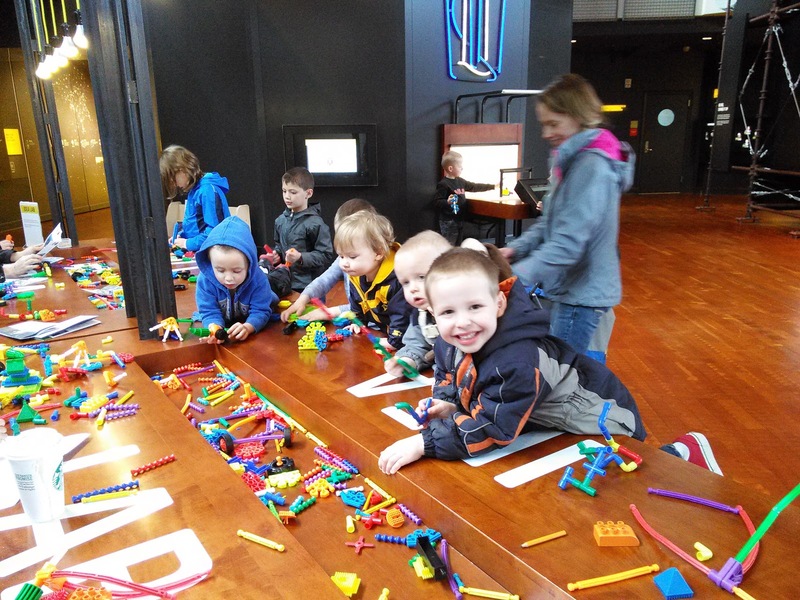 All of the kids wanted to build something to take a picture of for the revolving digital display next to the building station. We went to the top floor to look through the periscope at the surrounding buildings and draw a picture of something we saw. 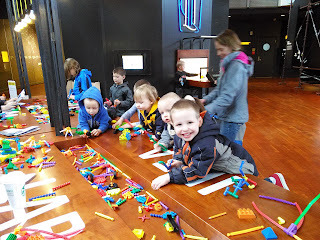 Then we went to the third floor to play with the building toys and watch a short video of transportation in Seattle over the years. Sammy loved the video. It was fun to go on a free day so we didn't feel bad that the kids were getting tired before we saw all of the history displays. 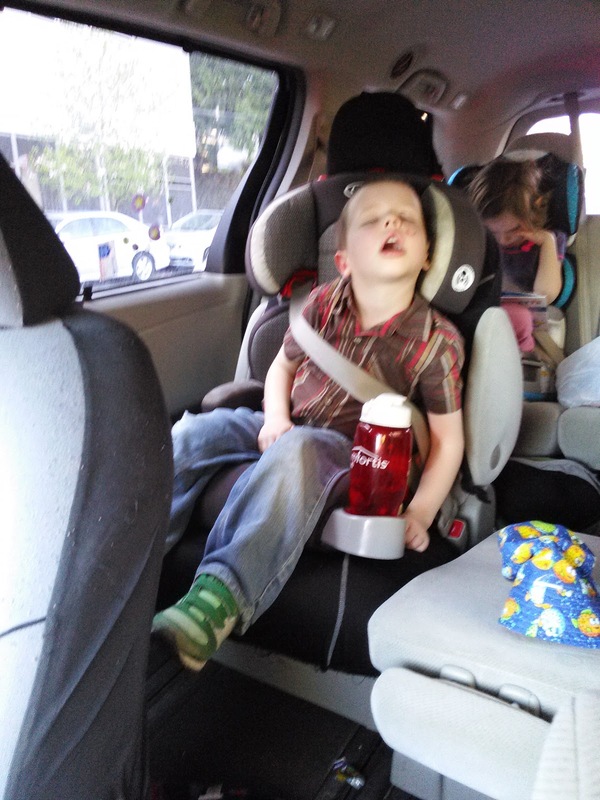 Spring break is exhausting!